Here is the solution for folks who have pedestal-style furniture in their dining rooms, and would like to carry that theme into the living room. 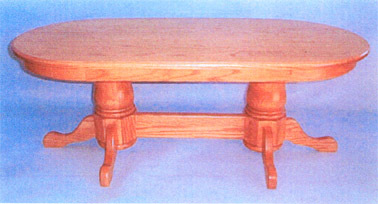 Our heavy double pedestal coffee table is built like a tank, out of the same solid oak, and to the same high quality as the rest of our furniture. Matching end tables and a sofa table are available to make your room complete!